McALLEN — Kristov Martinez is one of the best Division II college football players in the country. Honorable mention All-American, All-Super Region, All-Conference. 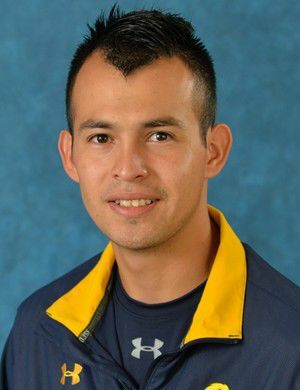 He leads Texas A&M University-Commerce in scoring and last weekend became the school’s all-time leader in PATs. But at 5-foot-7, 142 pounds, the field goal kicker’s size belies the impact he’s made on the gridiron and the powerful will he possesses. The Edinburg High product is smaller than most varsity players on RGV football rosters — much less a typical difference-maker on the No. 11-ranked Lions (5-1). But, the junior (on the field, academically he’s a senior) is well aware of who he is and what it takes to get the accolades he’s received. So far, it’s working. Martinez initially went to UTRGV with the hopes of playing soccer after graduating high school in 2014. However, that didn’t work out, and Martinez went back to the only university that showed interest in him as a football player during his time at EHS — where he once nailed a 54-yard field goal. Texas A&M-Commerce gave him a shot to walk on, and he made the team in 2015. That year, he started as the field goal kicking specialist. Kickoffs were left to another player. Still, Martinez impressed in his first season. In 12 games, he hit 12 of 19 field goal attempts and nailed 56 PATs. In 2016, he did even better (18 of 24 field goal attempts with a long of 46 and 55 PATs) and earned conference and national honors. This year, at midseason, his accuracy is even higher — and he’s the full time kickoff guy, to boot. What he is now is one of the best. And Martinez wants to leverage his position to impart to RGV athletes the importance of education. Football is fun and athletes should follow their dreams, but the kicker said the books are what really count in life. Our Lady of the Lake forward Adrian Delgado is playing outside of his mind as of late. The junior from Brownsville Hanna has scored nine goals in his last six matches to go along with two assists. The 5-foot-10, 165-pound accounting major ranks as one of best scorers in the NAIA Division I. The Red River Athletic Conference has taken notice. It named the OLLU Saints’ Delgado Conference Player of the Week for his performance during the week of Oct. 2-8. Delgado found the net three times in two conference wins. He had a goal and assist in a win over Wiley College, and he had two goals in a 7-0 victory over Texas A&M-Texarkana. The OLLU Saints are 7-3-1 overall and tied for first in the RRAC at 5-1. 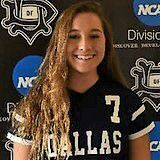 Gaby Gonzalez, a solid-as-a-rock defender for the University of Dallas, scored her first collegiate goal last month in a victory over Centenary College of Louisiana. The 2016 McHi grad had two shots on goal and converted one — a free kick from the right side for the Crusaders. 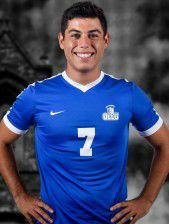 Gonzalez, as sophomore, received an academic scholarship from UD, an NCAA Division III university actually located in Irving. She was a four-year letter winner at McHi, scoring 14 goals as a senior for the Lady Bulldogs and helping lead them to a 12-0 district record. The UD Crusaders are 3-9-2 overall and tied for fifth place in the Southern Collegiate Athletic Conference at 2-6-1. Marina Martinez digs digging. The Donna High alum is so good at it, she’s leading the Red River Athletic Conference in digs, with 4.3 per set for Our Lady of the Lake. 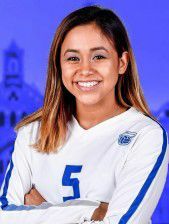 The junior libero, a transfer from Division I Prairie View A&M, has a total of 312 digs for the NAIA Division I Saints in San Antonio (she’s just ahead of Edinburg Vela product Miranda Washington). Martinez, a 5-foot-5 kinesiology major, was recently named RRAC Defender of the Week (Oct. 2-8) for the third time this season. She averaged 5.7 digs per set to lead OLLU to a 2-2 week that included a victory over Huston-Tillotson. The junior defensive specialist compiled 85 digs for the week, including 18 in the 3-1 win over HT and a high of 25 in a 3-1 loss to Saint Thomas. OLLU is atop the RRAC with a 9-0 conference mark, 14-7 overall.